to see the smoothie titan finally start dishing it out. We know what you’re thinking: This sounds insane. And that’s the whole point. 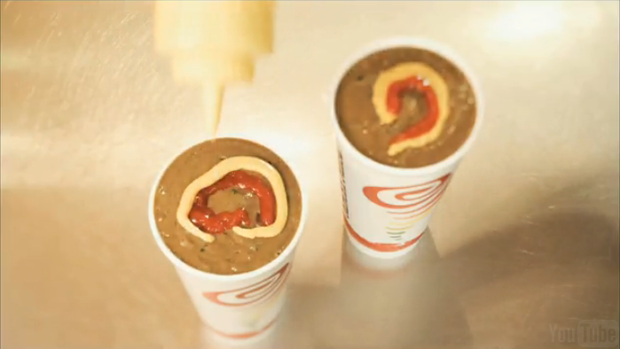 The stunt is a fake-out, engineered to suggest that a burger joint getting into the smoothie business is just as ridiculous as a smoothie joint blending up cheeseburgers. Coming from Jamba Juice, the logic is dubious. This is, after all, the same company that’s trying to broaden its business by selling pint-sized pizzas and oatmeal, which is no less far-fetched than McDonald’s dabbling in smoothies. But we’ll give credit where credit is due. The spoof-commercial is pretty funny, and offering viewers a $1 off Jamba Juice coupon for having to endure a full minute of “stomach clenching video” is a nice touch. Plus, we’ve heard those McDonald’s smoothies are kind of nasty.